Inspired by a 43-point opening quarter, it was unexpectedly easy for San Antonio. THE SAN ANTONIO SPURS showed no mercy against the Oklahoma City Thunder, easing to a 124-92 victory in game one of the NBA Western Conference semi-final. Coming off a series sweep of the Memphis Grizzlies in their first-round play-off, the Spurs – seeded second in the west – continued where they left off against the Thunder with a 43-point opening quarter on Saturday. The Spurs – who defeated the Thunder in the 2013-14 Western Conference Finals having lost to Oklahoma City at the same stage in 2011-12 - were led by LaMarcus Aldridge and Kawhi Leonard. Oklahoma City’s star duo Kevin Durant and Russell Westbrook were limited to 16 and 14 points respectively, as Serge Ibaka put up 19 points on the road. Game two is San Antonio on Monday. Email “Durant and Westbrook tamed as Spurs demolish Oklahoma City in semi-final opener”. 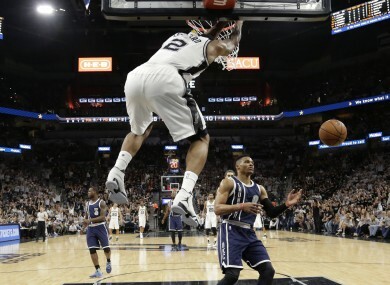 Feedback on “Durant and Westbrook tamed as Spurs demolish Oklahoma City in semi-final opener”.